I went by the Facebook offices on Monday to see a demo of what’s just been launched. The two products show information about people and things as they occur. The first, News Feed, appears on the user’s “Home” (admin) page and shows new photos posted by friends, relationship status changes, people joinging groups, etc. It basically removes the need to go to every friend’s site every day to see what changes occured to their profile. In many ways this reminds me of my RSS stream of news that I view every day in NetNewsWire, for the blogs and other sites I care about. The second product, Mini Feed, is a variation of News Feed but shows information only for a single user and appears directly on their profile page. It gives visitors to the page a quick view of what’s new for that user. Like everything on Facebook, both of these products are subject to the standard Facebook privacy settings. This means only people you allow to view this data will be able to see it. What appears is based on who you are, who they are, and what rules are set. These changes will confuse users for a while, but I agree with Ruchi Sanghvi on the Facebook blog who says “These features are not only different from anything we’ve had on Facebook before, but they’re quite unlike anything you can find on the web.” It’s interesting because Facebook clearly gets the idea of an attention metastream, where page views aren’t the currency that matters but rather how effectively the service allows users to communicate. 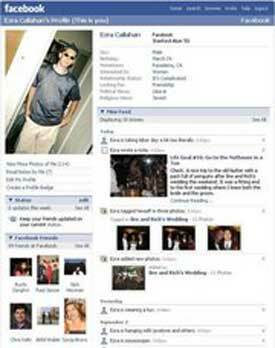 Facebook users will now have a much easier way of staying up to date on what their friends are up to. It may mean less page views for Facebook in the short run as users rarely have to leave their home/admin page to see what’s going on with friends, but if it makes users love Facebook more (is that possible? ), it’ll pay off in the end. 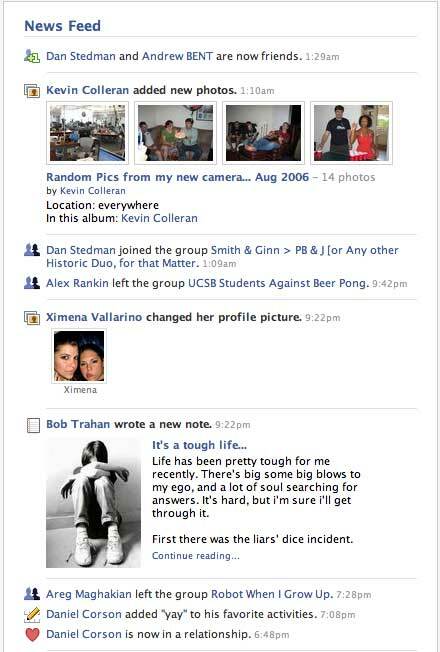 The screen shot below shows the News Feed rolling in on a Facebook user’s home/admin page.